Every summer I seem to want a new hat and I had already made one for this summer, but decided that I wanted another one, or even two! 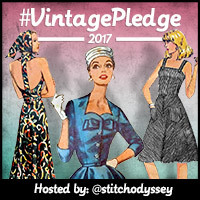 I once again used the Vintage Pattern Lending Library pattern that I won in last year’s Designin December (details of this year’s challenge here). I found the perfect fabric for a wide brimmed version at Materialise, (thank you for the suggestion Sophie!) and busily made the hat, but used fusible interfacing in the brim which bubbled when I ironed it – gah! I took the whole hat apart and remade it so that the bubbled part of the brim was underneath where it wasn’t visible, and now I’m much happier. I have worn both hats on our daily walks, stopping to smell the roses of course! and it goes with lots of my walking outfits. I think it’s pretty stylish. When I remade the hat I found that I really didn’t like the bow I created so I threaded in one of the many vintage buckles in my stash. I used a fairly subtle one as I didn’t have a red one which would have been my first choice. As soon as I saw the pattern I knew I wanted to make the second version, which has less of a brim and more of a cloche shape, and I must say that this is the one I will be wearing when I walk to the shops. I used some stunning fabric from a new shop in town: Woven Stories Textiles, which has the most marvellous collection of Indian textiles. This one has a different shape. The brim is wide at the sides and narrower front and back, but I could not shape it into the anything which resembled the picture on the pattern, which is always the problem with line drawings. Once again I used a vintage buckle to help me form the bow on the band. Although the brim isn’t as wide, it still shades my face fairly well. and I rather like the shape of the crown, which has three darts at the back gathered into the band. Mark has been so impressed with my hat collection that he’s asked me to make him a wide-brimmed hat. Naturally I am on it already! Both hats are fantastic and it’s hard to choose a favorite!! The buckle is a lovely touch and a great idea. The park and rose garden is fabulous! It’s a peace garden and it’s really lovely at this time of the year – I always stop and smell the roses! I was rather pleased to use my buckles! I love your hats. I’ve knitted winter ones but never made a fabric one. I should look into it. Maybe use some of my leftover fabric? Ooh yes, hats are great for scrapbusting! Hats off to your hats! Both look perfect, but if I had to choose only one I would take the beige one as I prefer a large brim all around. Can’t wait to see Mark’s! Have you found a pattern for his? Thank you so much, but actually the multi coloured hat has the larger brim! I think they both have a place, but I actually prefer the beige one too. No longer as he has his own hat now! Thanks for the mention of Designin December. I love the drawing on the pattern envelope! It’s lovely seeing your hat in the sunshine as we are presently using umbrellas in the rain! Oh yes, getting chilly in your part of the world. We still haven’t got really warm weather yet, so those hats are going to be handy when it hits.